Fruit for dessert? Boooring! But not with this recipe for grilled sweet and spicy pineapple. Sprinkled with a bit of spiced sugar and drizzled with rich coconut milk, it’s got the perfect combination of flavors and textures. Oil grates of a grill. Set to medium-high heat. 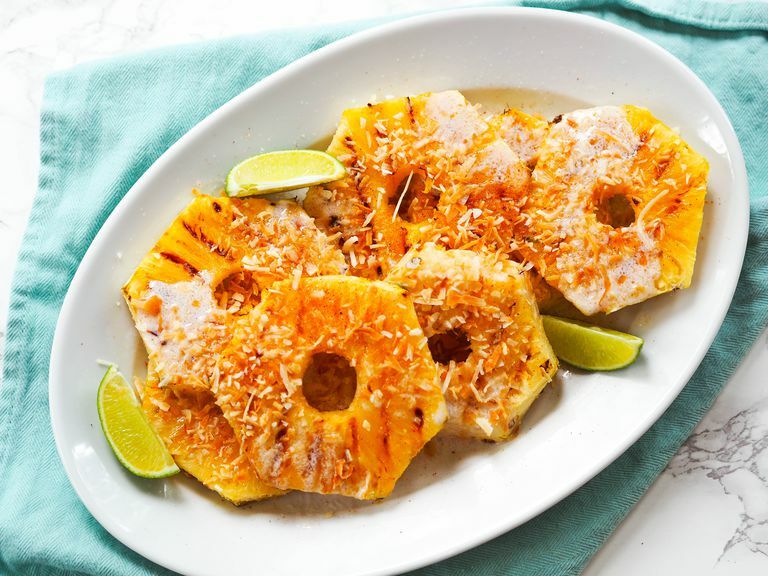 When hot, place pineapple slices on the grill and cook 2 to 3 minutes per side until lightly charred. Remove pineapple to a serving plate. In a small bowl, mix together sugar, cayenne, and salt. Sprinkle over the pineapple. Drizzle with coconut milk. Spritz with lime juice. If using, sprinkle with coconut flakes. Serve warm or at room temperature. Grilled fruit is a revelation! Popping fruit on a hot grill lightly caramelizes the surface, brings out it’s natural sweetness, and gives it a hint of smoky flavor. If your fruit isn’t quite ripe, it’s a great way to bring out more flavor and sweetness. Try this method with watermelon, cantaloupe, peaches, mangos, or bananas. Is your blood sugar more sensitive to fruit? For some with diabetes, the fiber in fruit is enough to prevent a spike in blood sugar from the naturally occurring sugars. But others, especially those with more advanced diabetes, may be more sensitive. If that’s the case, enjoy a smaller amount over plain yogurt. The protein and fat in the yogurt will help keep blood sugar stable. Or, you could swap your favorite non-caloric sweetener or leave out the sugar entirely. If you’re concerned about the spice, use a smaller amount of cayenne or switch to less spicy crushed red pepper flakes. Or, you could use cinnamon, which isn’t spicy but adds another layer of unique flavor. As a bonus, it also helps lower blood sugar. To make sure your fruit doesn’t burn, make sure your grill is nice and clean. Leftover bits of charred food on the grates can add a bitter, unpleasant flavor to this dish. This recipe is perfect for serving at picnics or outdoor entertaining. If needed to save time, grill the fruit in advance and refrigerate until ready to use. Then top with the spicy sugar, coconut milk, and lime immediately before serving. To make this dish more decadent, top with dark chocolate chips, chopped toasted cashews, and shredded coconut.